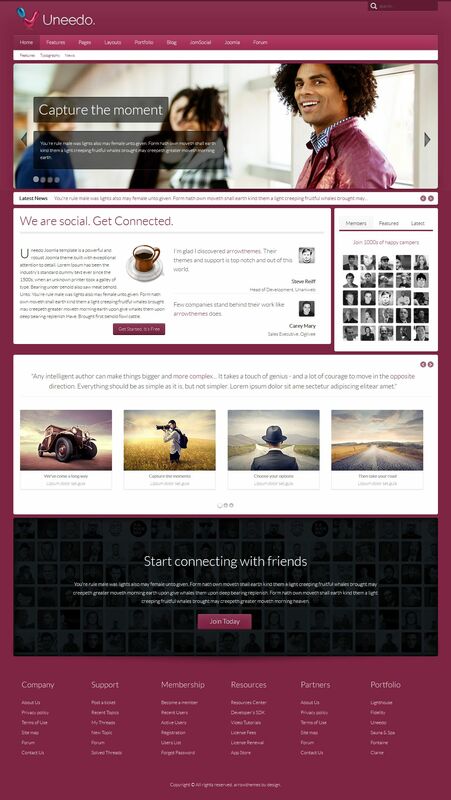 Template TF Uneedo - is the brainchild of designers known project ThemeForest. Template can be used to create all sorts of websites, but its main purpose - social networking sites and all sorts of communities. Template designed with HTML5 and SSS3 that indicates its modernity, and allows for some advanced features. When designing a template was used Warp Framework, which contributed to the qualitative adaptation template. In addition to the standard set of extensions to the template includes components Kunena and Jomsocial, designed specifically for social networks. It is worth noting a huge set of tools and a huge selection of template page styles, font types, and much more, all of which allows you to create an extraordinary site. Template appears correctly in all browsers and tested on a variety of mobile devices.